Explore our new Resource Kit and learn more about the needs of people within your communities. Back in July – we announced the launch of the first Let’s Talk About It: CSL Big Red Resource Kit to help library staff from rural libraries do what they do better. This first kit was focused on working with people experiencing homelessness in our communities, and contained programming ideas, suggested library materials, community conversation guidelines, and more. Well… we are please as punch to say we have done it again – and have another kit available to help library staff better reach another under served population within their communities – the Lesbian, Gay, Bisexual, Transgender, Queer, Questioning, or Gender Non-conforming Kit (AKA LGBTQ+). The Let’s talk about it! : CSL Big Red Resource Kits program was created to help public library staff within the state of Colorado better understand and serve traditionally under-served populations and to give staff the tools needed to host and facilitate critical community conversations, mending fences within their communities. We hope that using the Let’s talk about it! : CSL Big Red Resource Kits will help establish the library as a safe place for civil dialog in our communities. 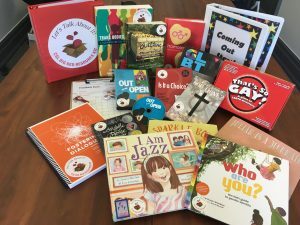 Our new kit – the Lesbian, Gay, Bisexual, Transgender, Queer, Questioning, or Gender Non-conforming Kit – is full of informative materials that are both educational and fun. There are games to help members of the community understand many of the issue facing the LGBTQ member, suggested reading and online resources that can help promote understanding and empathy among community members, and ideas on ways to make your library more inviting and accommodating to the LGBTQ community and your LGBTQ patrons. We invite you to check out the new kit on our CSL Resource Kit website. and we encourage you to explore other kits available, from early literacy to STEAM activities in discovery, music and art. For more information about borrowing any of our available kits, contact Madison Basch (basch_m@cde.state.co.us) .